Reading Elie Wiesel’s Night with students can be solemn and thoughtful with the right activity. This is a 6 slide PowerPoint with a two page handout. Students can complete this optional mini-project assignment at any point after reading chapter 6. This project will allow students a time reflect upon what they have read and to really consider how this atrocious event was a reality to millions of others. 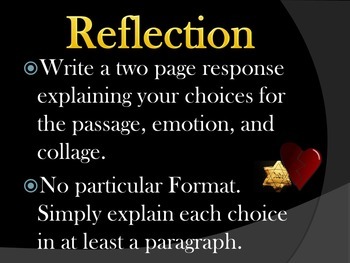 This assignment will also provide an outlet fr students to express their feelings regarding Wiesel’s memoir. For this mini-project students do different things to help them express certain feelings while reading the memoir. Activities include a collage, song selection, and different others. Students will present these projects to their classmates and listen to each other’s song selections. 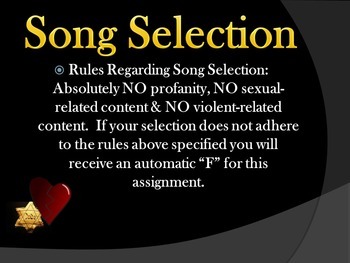 I only allow students to play their song for about 45 seconds. From my personal experience with student presentations, the songs selected are often sad but will help students to say what they often can not find the right words to say regarding the Holocaust. I usually allow my students one day to work on this activity in class. 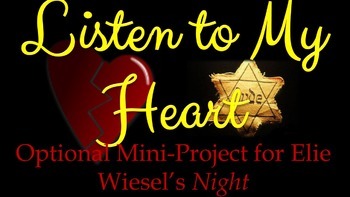 After a few days of continued lessons with Elie Wiesel's Night, I will allow a class period for student presentations. This product is also included in Elie Wiesel’s Night Common Core Aligned Curriculum Unit. To purchase for $17.99 CLICK HERE!